In 1954, eight families joined together and purchased a residence on Joliet Avenue, and established the Alamo Heights Church of Christ. The first service was held on May 16, 1954. By 1958 the congregation was overflowing and the church purchased land at our current sight (N Loop 410 & Post Oak Lane). The construction of a 300-seat auditorium and eighteen classroom began in 1959. 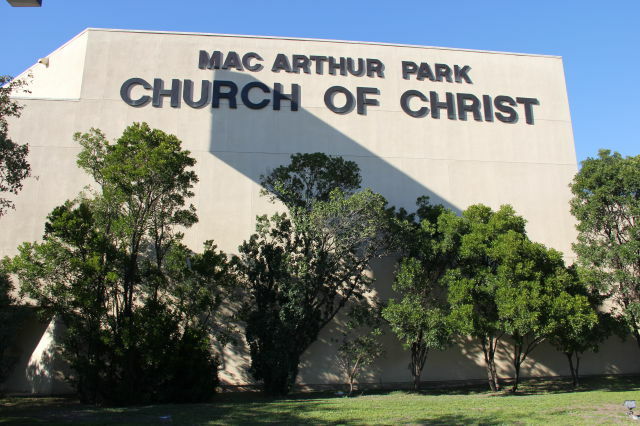 The first service of the MacArthur Park Church of Christ held at our current location was on October 21, 1959. The congregation continued to grow. A new classroom addition was added in 1972 to the existing facility. In March 1979, a 900 seat auditorium and expanded parking was completed. In 2004 we celebrated 50 years of ministry to San Antonio as many previous and current members joined together for a special Homecoming Celebration. In 2014 the Fellowship Hall which served as the orginal 1958 auditorium was returned to it's near original size to accomondate larger activities and we celebrated 60 years of ministry in San Antonio. The MacArthur Park Church of Christ continues to serve the community around us. We look forward to what the Lord has planned for our future.